Fifty years ago, Jimmy Hughes released what was the first album to bare the Fame Records logo, Steal Away. It was released after the title-track, Steal Away gave Jimmy Hughes the biggest single of his career. On its release, Steal Away gradually climbed the charts. Its rise wasn’t meteoric. Instead, it was steady. Eventually, Steal Away reached number two in the Cashbox R&B chart. Then on 20th June 1964, Steal Away entered the US Billboard 100. After a slow climb, Steal Away reached number seventeen in the US Billboard 100, and spent twelve weeks in the charts. For Jimmy Hughes, this transformed his life. Having just enjoyed a huge hit single, Jimmy Hughes had the confidence to quit his job in Robbins Rubber factory. No longer would he be Jimmy Hughes part-time singer-songwriter. Now Jimmy Hughes was following in the footsteps of his cousin Percy Sledge. 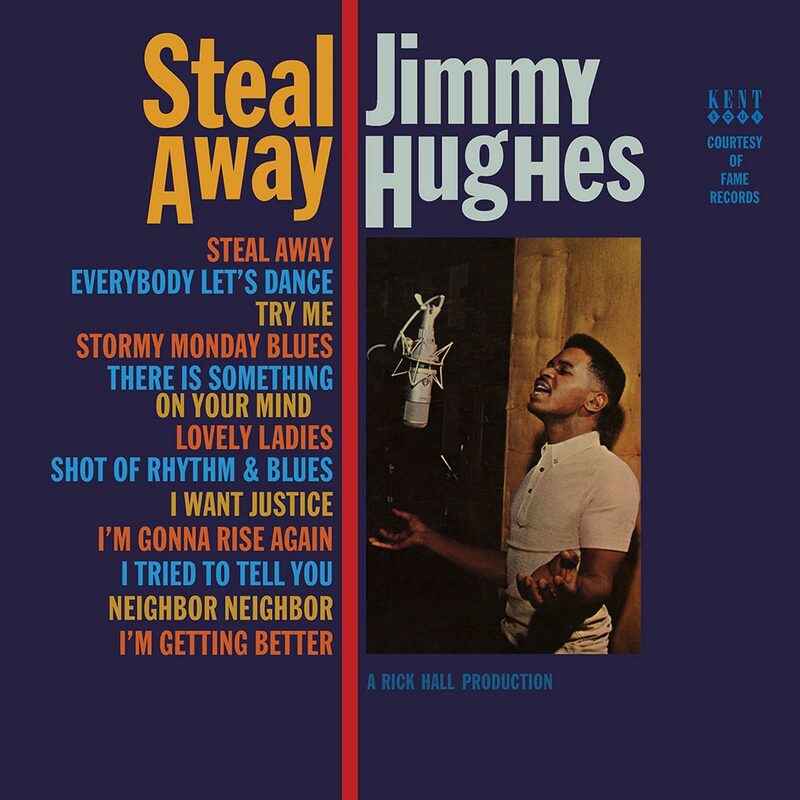 One of the first things Jimmy Hughes did when he became a professional musician, was begin work on his debut album Steal Away, which was released later in 1964. That’s nearly fifty years ago. To celebrate the fiftieth anniversary of Steal Away’s release, Kent Soul, an imprint of Ace Records have recently released Jimmy Hughes’ debut album. It’s been released on 180gm heavyweight vinyl and is the latest instalment in Ace Records vinyl collection. Steal Away was Jimmy Hughes debut album. It should’ve launched a long and successful career. Sadly, that wasn’t the case. Between 1962 and 1970, Jimmy Hughes only released three albums. After that, Jimmy retired from music and withdrew from public life. Many people have wondered why? There’s no mystery, Jimmy simply became disillusioned with music. He felt his music wasn’t being sufficiently promoted by Volt Records’ boss Al Bell. Jimmy was also tired of touring and being away from his family for long periods of time. Eventually, Jimmy decided he’d had enough. So, he walked away from music. After that, Jimmy took a job working for the US government making parts for nuclear power plants. His only involvement in music was singing in his church choir. Sadly, Jimmy Hughes’ music never found the success of his cousin Percy Sledge. It all looked could’ve been very different. Jimmy Hughes was born in 19938, in Leighton, Alabama which is near Muscle Shoals. Whilst still in high school, Jimmy joined a gospel quartet, The Singing Clouds. This proved to be Jimmy’s musical apprenticeship. After Jimmy left high school, he got a job in the Robbins Rubber factory. Music was only a hobby back then. He worked during the night, and was a member of The Singing Clouds by night. Nobody ever expected Jimmy to embark upon a musical career. Not even Jimmy. He’d rather have been a basketball player. However, Jimmy had a change of heart in 1962.
record producer Rick Hall of Fame Records. Rick Hall was so impressed that he recorded Jimmy’s debut single I’m Qualified. This was a track Rick had co-written with Quin Ivy. I’m Qualified became Jimmy’s debut single and was released on the Philadelphia label Guyden. After the single was recorded, Jimmy returned to his day job in a rubber factory. Two years later, Jimmy and Rick Hall’s path’s crossed again, when Jimmy returned to Rick with a ballad he’d written Steal Away. The song based on the gospel song Steal Away To Jesus, was recorded in just one take. Little did Jimmy and Rick realise it, but this one song would help define the Muscle Shoals sound that become so hugely popular and famous. Jimmy entered the studio and recorded a cover of James Brown’s Try Me. It’s given a heartfelt, needy makeover by Jimmy. On its release, Try Me reached number sixty-five in the US R&B Charts. Now it was time for Jimmy Hughes to record his debut album Steal Away. Steal Away was a mixture of new songs and cover versions. Jimmy only contributed one track, Steal Away. Cover versions included Terry Thompson’s A Shot Of Rhythm and Blues, James Brown’s Try Me, Joe South’s I’m Gonna Rise Again and T-Bone Walker’s Stormy Monday. Lovely Ladies was one of the first songs penned by Dan Penn and Spooner Oldham. Dan Penn also penned I Tried To Tell You. Other tracks included Cecil McNeeley’s There Is Something On Your Mind, Huey Meaux’s Neighbor, Neighbor, William Bruce’s I’m Getting Better and Oscar Franck’s I Want Justice. 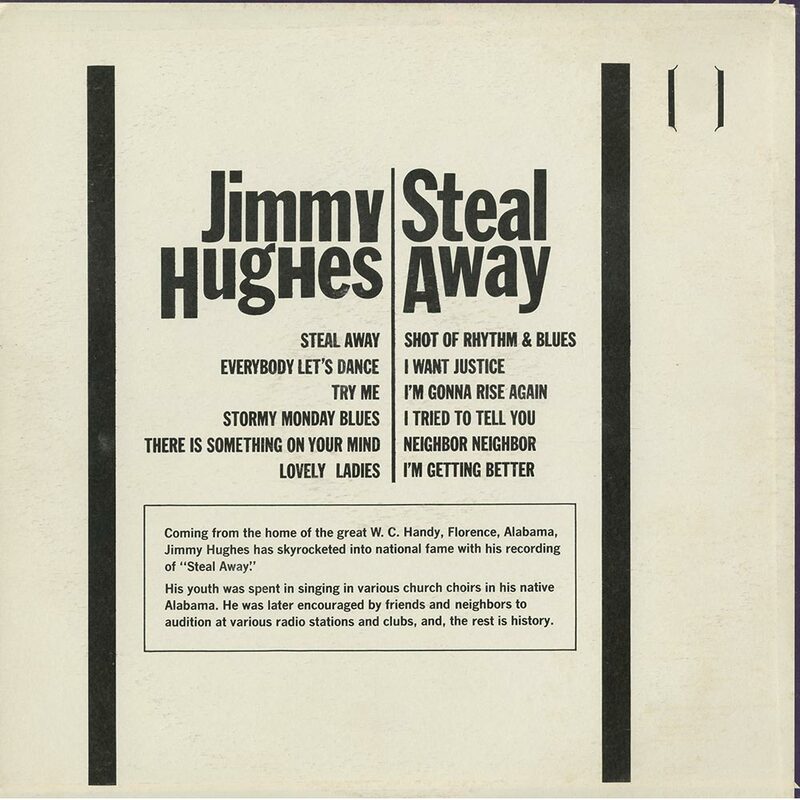 These twelve tracks became Jimmy Hughes’ debut album Steal Away. Recording of Steal Away took place at Fame Recording Studios, Muscle Shoals. Accompanying Jimmy Hughes was the Muscle Shoals Rhythm Section and Muscle Shoals Horns. They were some of the hottest and tightest musicians of that era. This included drummer Rodger Hawkins, bassist David Hood, guitarist Jimmy Johnson and keyboardist Barry Beckett. When they recorded together, they were one of the finest backing bands ever. Jimmy Hughes couldn’t have asked for a better backing band on his debut album Steal Away. It was released in late 1964. Everyone had high hopes for Steal Away. Surely with the right combination of material, a crack backing and Jimmy breathing life, meaning and emotion into the twelve songs, Steal Away couldn’t fail? Sadly, Steal Away sunk without trace. So few copies sold that original copies of Steal Away are a real rarity. There was a good reason for Steal Away’s commercial failure. Vee-Jay, who distributed Fame Records’ releases had financial problems. They didn’t have the funds to promote Steal Away. Not long after this, Vee-Jay became insolvent. It filed for bankruptcy. Luckily, Rick Hall had only leased Fame Records’ releases to Vee-Jay. This was a small crumb of comfort for Jimmy, who must have been wondering whether he’d have been better off working in the rubber factory. We should be grateful he didn’t remain in the Robbins Rubber factory. If he had, Jimmy would never have released Steal Away, which I’ll tell you about. Opening side one of Steal Away is Lovely Ladies. The rhythm section and braying horns provide an irresistible, joyous backdrop for Jimmy’s vocal. It’s tender and seductive. From the get-go, Jimmy dawns the role of seducer-in-chief. Behind him, guitars jangle, horns blaze and the rhythm section provide a sultry, sometimes choppy backdrop. All the time, Jimmy’s vocal is needy and tinged with longing and loneliness. Concern and worry fills Jimmy’s vocal on There Is Something On Your Mind. Cooing harmonies, chiming guitars, the rhythm section and rasping horns join forces. Together they combine elements of blues, R&B and soul. This is the perfect backdrop for Jimmy’s hurt-filled vocal. He lays bare his hurt and heartache for all to hear. However, try as he may, he can’t forget the woman who betrayed him. As A Shot Of Rhythm and Blues unfolds, it takes on an early sixties sound. There’s a nod towards rock ’n’ roll, pop and even the Beach Boys. It’s very different from the two previous songs. However, it shows how versatile Jimmy and the Muscle Shoals Rhythm Section and Muscle Shoals Horns were. They’re joined by female backing vocalists. They accompany Jimmy, and also add handclaps. Against a backdrop of whoops, hollers and whistles, Jimmy delivers a slice of hook-laden bubblegum pop. Neighbor, Neighbor features a despairing, frustrated Jimmy. He’s fed up with his nosey neighbours. They’re always listening to what’s going on in Jimmy’s house. So he fires a warning shot across their bows during the song. All his frustration and anger comes to the surface. It overflows. As this happens, the rhythm section, Hammond organ and searing combine to create an arrangement that’s got Southern Soul written all over it. Steal Away closes side one of Steal Away. It’s without doubt, the highlight of side one. It has an understated arrangement. Just the piano, rhythm section and cooing harmonies accompany Jimmy’s heartfelt, hopeful vocal. His vocal oozes emotion as he sings: “your folks are sleeping, lets not waste any time, lets Steal Away.” As he sings these lyrics, the arrangement builds. Harmonies, urgent drums and Hammond organ sweep in. Jimmy’s vocal grows in power, hope and urgency, resulting in a truly beautiful soul classic. Try Me opens side Two of Steal Away. Here, Jimmy reinvents the James Brown track. So good is his version, that he makes the song his own. There’s not yelps, hollers or whoops. Instead, Jimmy delivers an gentle, hopeful and needy vocal. The arrangement is suitably understated. Stabs of piano, a shuffling backdrop, harmonies and bursts of rasping saxophone frame Jimmy’s vocal. As a result Jimmy’s vocal and Rick Hall’s arrangement is like a meeting of minds. They’re like yin and yang, complimenting each other perfectly. I’m Gonna Rise Again bursts into life. Rasping horns and the rhythm section join forces. Then when Jimmy’s vocal enters, he’s accompanied by harmonies. The track takes on a gospel sound. Especially when Jimmy sings: “I’m Gonna Rise Again.” This gives the track an uplifting and joyous sound. Helping Jimmy all the way are the cooing harmonies. They add to the song’s soulfulness. Abruptly, the pan and hurt of I Tried to tell You unfolds. Urgent backing vocals accompany Jimmy’s vocal. His vocal is rueful and tinged with sadness. Especially when he sings: “I found somebody else.” He’s torn between the past, the present and the future. He knows what he should do, but is torn. All the time, a jangly piano, chiming guitar and rhythm section combine with sweeping harmonies. The result is a soulful soap opera. I’m Getting Better features a heartbroken Jimmy. Things are getting better for him. Hopefully, he sings: “maybe it wont be long, till all my hurt is gone.” A weeping Hammond organ joins a probing rhythm section and cooing harmonies. This is the perfect backdrop for Jimmy’s lovelorn vocal. It frames it perfectly, allowing Jimmy’s vocal to shine. Stormy Monday Blues was written by T-Bone Walker, and is, without doubt, a stonewall classic. Oft-covered, Jimmy delivers a heartfelt, impassioned soulful vocal. Accompanying him are a jazz-tinged guitar, rhythm section and rasping horns. They mix blues, R&B and soul. The finishing touch are the harmonies. They sweep in and compliment and highlight Jimmy’s vocal as seamlessly, he combines blues, gospel and soul. The joyous I Want Justice closes Steal Away. It has a poppy hue that has early sixties written all over it. Handclaps, harmonies and the rhythm section combine as pop and soul combine. Later, braying horns enter as Jimmy delivers a rousing, stirring version of I Want Justice. For Jimmy Hughes, the failure of his debut album Steal Away, was a huge blow. He knew Steal Away deserved to fare better than it did. Sadly, circumstances out-with his control put paid to Steal Away’s success. It was a case of if-only. If only Rick Hall of Fame Records cut a deal with another distributor, rather than Vee-Jay. After all, Vee-Jay looked like they weren’t long for this world. That proved to be the case. Vee-Jay imploded. Not long afterwards, Vee-Jay became insolvent and was filing for bankruptcy. For Jimmy Huges his career continued. 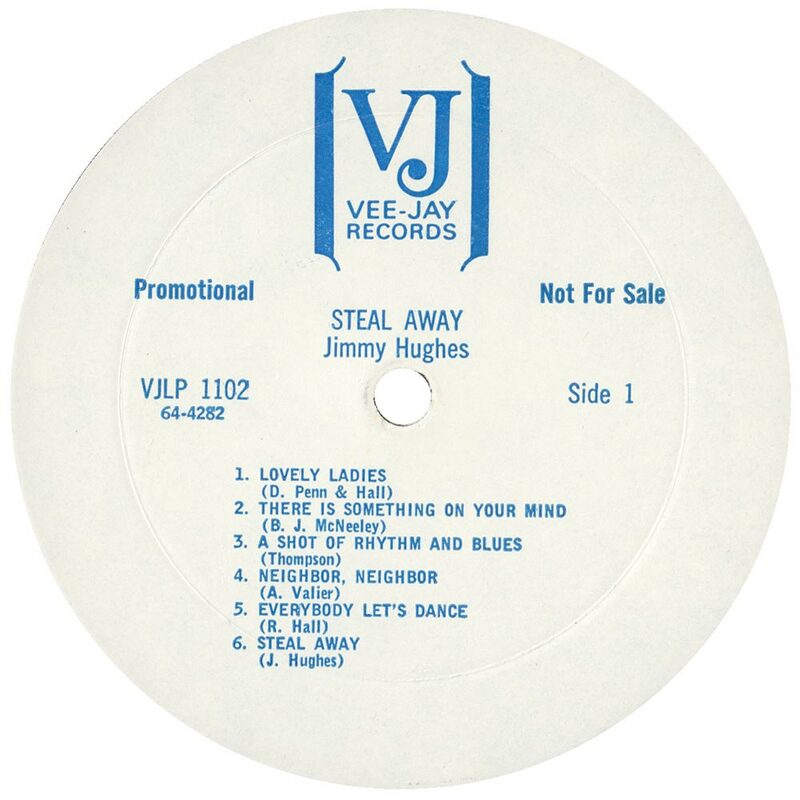 Despite the failure of his debut album Steal Away, Jimmy Hughes toured with some of the great names in soul music, including Bobby Womack and Jackie Wilson. For a relative newcomer like Jimmy, this was akin to a musical education. He would learn about stagecraft and how to command an audience. Having rubbed shoulders with the soul greats, Jimmy entered the studio again. When Jimmy’s next few singles failed to build on the success of his first two singles, Jimmy was sidelined. Vee-Jay decided to focus on acts like The Four Seasons and The Beatles. Things weren’t looking good for Jimmy. Then his cousin Percy Sledge released a classic single, When A Man Loves A Woman,. On the back of Jimmy’s cousin Percy Sledge’s successful classic single When A Man Loves A Woman, Rick Hall managed to get Jimmy a new deal for his label to be distributed by Atlantic. This coincided with an upturn in Jimmy’s fortunes. His next three singles on Fame, Neighbor, Neighbor reached number four in the US R&B Charts and sixty-five in the US R&B Charts in 1966, while I Worship the Ground You Walk On reached number twenty-five in the US Billboard 100. In 1967, Why Not Tonight reached number five in the US R&B Charts and ninety in the US Billboard 100. Jimmy’s next single It Ain’t What You Got reached number forty-three in the US Billboard 100. It was 1967 that Jimmy’s sophomore album Why Not Tonight was released. When Why Not Tonight was released in 1967. 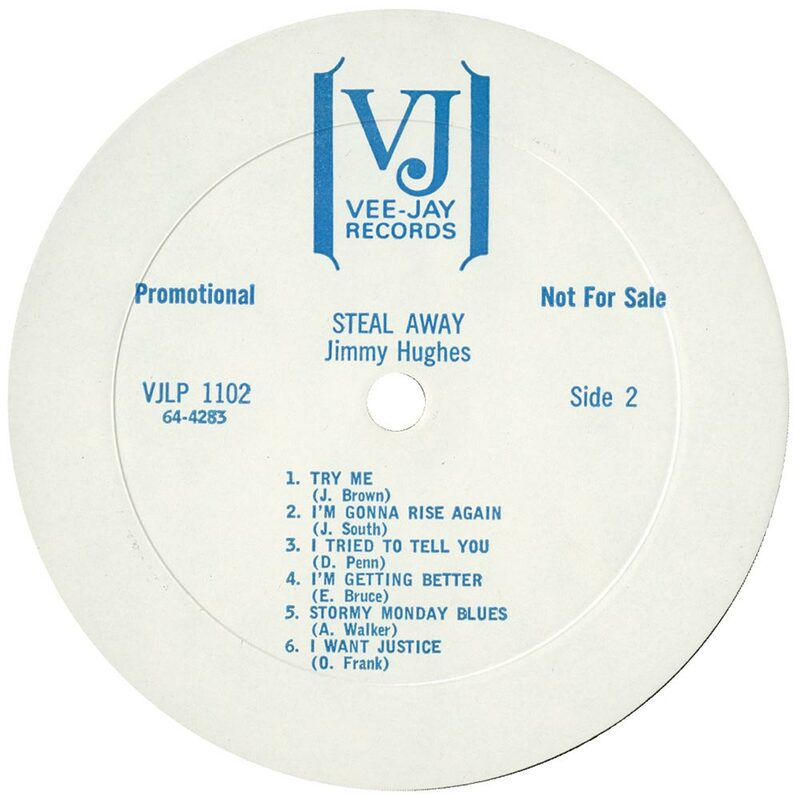 Just like Steal Away, commercial success eluded Jimmy Hughes. His singles were more successful than his albums. The lack of success was beginning to affect Jimmy. After Why Not Tonight, Jimmy only released one further album, Something Special. After eight years in the music business, Jimmy Hughes turned his back on music. Jimmy found a job making parts for nuclear power plants. His only involvement in music was singing in his church choir. Sadly, Jimmy Hughes’ music never found the success of his cousin Percy Sledge. However, although Jimmy Hughes career may not enjoyed the commercial success, critical acclaim or longevity of his contemporaries, he produced three hugely underrated albums. The best of this triumvirate of albums was Steal Away which was released fifty years ago. To celebrate that anniversary, Kent Soul, an imprint of Ace Records have recently recently released Jimmy Hughes’ debut album Steal Away on 180gm heavyweight vinyl. It’s the latest instalment in Ace Records vinyl collection, where it joins illustrious company. That’s fitting. After all, Steal Away was an important album. Steal Away wasn’t just Jimmy Hughes debut album. It was also the first album Rick Hall’s Fame Records released. Steal Away is also credited with defining the Southern Soul sound. So, Jimmy Hughes is a soul pioneer who is only now, receiving the critical acclaim his music deserves. Jimmy Hughes’ finest hour was, without doubt Steal Away, which showcases one of soul’s best kept secrets. ← HADDA BROOKES-QUEEN OF THE BOOGIE AND MORE.